Cahir / Caher (pronounced “Care”) (an Cathair – “the Rock / Fort”; from Cathair-dun-Iascaigh – “the (Stone) Fort of the Fish”) (pop.3000) is an exceptionally pleasant old estate / market / garrison / post town on the River Suir, with an attractive Georgian / Victorian streetscape and several good pubs, eateries and accommodation options. The ancient Book of Lecan records the destruction of a fort on the rock in the C3rd AD and Brian Boru (926 – 1014) is said to have had one of his residences here. The Gaelic chieftain Conor O’Brien, Prince of Thomond, erected a fortress on the rock in 1142. Philip de Worcester founded the Norman edifice, but it was James Butler, created Earl of Ormond in 1375 for his loyalty to King Edward III, who made this into one of the most powerful castles in the country, a virtually impregnable fortress from which his second son and generations of his descendants controlled the barony of Iffa and Offa West. Thomas Butler (d. 1558), created Baron Cahir in 1543, married Eleanor Butler, fifth daughter of Piers Butler, 8th Earl of Ormond. He was succeeded by his only surviving son, Edmund Butler, 2nd Baron Cahir, who died himself two years later. As he had no legitimate male heirs, the title became extinct. It was, however, revived in favour of his first cousin, Theobald Butler, 1st Baron of Cahir (second creation). Thomas Butler, 2nd Baron of Cahir took up arms against Queen Elizabeth I in the Nine Years War; the castle was captured in 1599 after an artillery siege by the army of the Earl of Essex (his only significant achievement in Ireland), during which the Baron was held prisoner, although his wife and brother James held out for ten days of very damaging bombardment. The castle was put under the charge of Sir Charles Blount for a year. In 1600 the Baron joined in the Earl of Tyrone‘s rebellion, but soon surrendered and was attained. In 1601 he was pardoned for all treason and crimes. As his two marriages were without male issue, his death in 1627 saw his uncle Piers Butler‘s third son Thomas become the 3rd Baron (the same year as castle was the scene of a celebrated killing when his son-in-law, Lord Dunboyne, murdered his distant cousin James Prendergast in a dispute over an inheritance). Thomas”s heir, Edmund, predeceased him, so he was succeeded by his grandson, Pierce Butler, 4th Baron Cahir. During the Wars of the Three Kingdoms, the castle was surrendered twice by the adolescent Lord Cahir’s guardian, George Mathew, once in 1647 to the Parliamentarian Lord Inchiquin (“Murrough of the Burnings”) following his victory at the Battle of Knocknanauss, and again in 1650 to Oliver Cromwell himself, without a shot being fired. The family were allowed to retain their property after signing a set of Articles (now in London’s British Museum). The 4th Baron died in 1676 without male issue. Edmund’s son Theobald Butler, 5th Baron Cahir, died in 1700; his grandson James Butler, 7th Baron Cahir, died without issue in 1746. His brother Pierce Butler, 8th Baron Cahir, died without issue in June 1788, ending the line of Theobald. James Butler, 9th Baron Cahir, was the son of Richard Butler of Ballinahinch / Ballynahinch, grandson of Edmund, and was thus the great-great-grandson of the 1st Baron. He was in India at the time of his predecessor’s death and so never received the news of his elevation before he died a month later in July 1788. His son Richard Butler, 10th Baron Cahir, who built Caher House and whose tenure saw the family fortune grow considerably with the arrival of industrious Quakers (many of whom lived in the distinctive Georgian houses of Upper Abbey Street) and the opening of a new garrison, was created Viscount Cahir and Earl of Glengall in 1816, and died in 1819. Having fallen into ruinous condition, the castle was largely restored and “improved” in 1840 by Richard Butler, 11th (and last) Baron Cahir and 2nd Viscount Cahir / Earl of Glengall, whose financial circumstances forced him to sell it ten years later. His only child, Lady Margaret Butler, married the 9th Earl of Wemyss’s son, Lt Col Hon Richard Charteris (d. 1874), who repurchased it. A plaque commemorates Lt Col Richard Butler Charteris, who was born in the castle in 1866, and died in 1961, whereupon the castle reverted to the State. It was declared a National Monument in 1964, and has been in the care of the OPW and open to the public since 1970. The castle was used in the filming of Monty Python and the Holy Grail (1975), John Boorman‘s Excalibur (1981), Tom Donovan‘s Tristan and Isolde (1981, starring Richard Burton), and more recently the successful Irish TV series The Tudors. An extensive library, housed in an C18th cottage built for the greater comfort of the Butler family residents within the castle walls, is open to researchers. Ordinary visitors can view an audio-visual presentation plus an interesting historical exhibition, including an excellent model, and wander around the castle, but the informative and entertaining guided tour is highly recommended. Caher Park, originally part of the castle demesne, planted c.1790 as a deer park for Cahir House, is very attractive, with paths meandering through mature woodland of beech, oak, Spanish chestnut, sycamore and other broadleaf trees. Wildlife includes red squirrels, pheasant and woodcock. Horse riding facilities are also available. Unfortunately, part of the land is occupied by a golf course. The Coronation Walk, named for the crowning of King George IV in 1821, connects Cahir Castle and the Swiss Cottage through Caher Park. Lined with laurel, rhododendrons and elder, it takes in a splendid Dovecote and runs beside the River Suir, where swans, ducks and cormorants can be seen. It was built in 1810 to provide the relatives and friends of Richard Butler, 10th Baron Cahir and later 1st Viscount Cahir and 1st Earl of Glengall, with a lodge of fashionably romantic rustic simplicity from which to enjoy their hunting, shooting and fishing. The roof thatch, ornate timberwork and climbing roses cannot conceal its generous dimensions, including ballroom and wine cellar. Its status as a unique period piece makes it a popular attraction. Although compulsory, the Guided Tours are well-worth taking. The Butler family were also responsible for many of Caher’s other buildings. Described by CS Hall in Ireland – Its Scenery, Character & History (1846) as “an encouraging and considerate resident landlord“, Richard Butler, 2nd Earl of Glengall, who commissioned much of the town’s layout and several significant edifices, lost most of his property through bankruptcy (due mainly to his ambitious building programmes, but also to depletion of income during the Great Famine). The Cahir Estate was partially repurchased by his son in law, Lt Gen Richard Charteris, and remained under the family’s control until 1962. Cahir Abbey, an Augustinian establishment known to have existed in 1200, was also called the Priory of St. Mary and Caherdunesque / Kaherdunesch. An early patron was Geoffrey de Camville, Baron of Fedamore, and the Cahir and County Limerick abbeys were closely linked for several centuries. The last Prior, Edmond O’Lenergan, surrendered the abbey upon King Henry VIII‘s 1540 Dissolution of the Monasteries and was made Vicar of the parish church of St Mary. The chancel of the (possibly older) church survives, with a good row of C15th single-light windows in the north wall, and an interesting very late east window with carved heads. 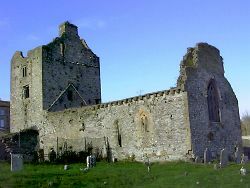 The massive residential tower was most likely built in the years immediately following the 1540 Dissolution, using the stones of the nave and residential buildings of the Priory. A second, smaller residential tower is located in a detached position to the South. Old St Mary’s parish church on Old Church Street was originally built during the medieval period as one of the satellite churches of Cahir Abbey. The multi-period ruin comprises a nave and chancel joined by a now partly built-up arch. plus a double bellcote at the west end; certain features of the chancel suggest a C15th date, although there remains the possibility that it occupies the site of an earlier structure. It was used for Anglican worship from the Reformation until 1820, when complaints concerning its unsuitable size, location and design led to its replacement. St Paul’s church (CoI), built in 1817-18 and consecrated in 1820, is an exceptionally fine building, one of only two surviving churches designed by John Nash, and the only one with most of its original interior intact, including galleries and pews. The edifice is noted for its splendid towers and fine stained glass windows (including one by Ninian Comper), sadly protected by ugly iron grids due to repeated incidents of vandalism. The Erasmus Smith House on Church Street was designed by John Nash and built in 1818 as the schoolhouse for the Anglican parish (although open to children of all denominations) by Richard Butler, 1st Earl of Glengall, with funding from The Erasmus Smith Trust. A National School from the second half of the C19th until 1963, it was then put to varied use until completely renovated for occupation by South Tipperary County Council. St Mary’s church (RC), built by John Mullaney of Cahir to a design by Dublin architect John B Keane, was commenced in 1833, consecrated in 1839 and finally completed in 1842, replacing a reportedly very impressive 1790 structure provided by the Butler family. The imposing pipe organ, made by the famous Willis firm, was installed in 1866, and the church interior was refitted in 1888-89. The present bland interior is the result of post-Vatican II “Liturgical Reordering” in 1970. Cahir Presbyterian church, located in Abbey Street, was completed in 1834 as the Meeting House of the Society of Friends (Quakers). In 1881, it was leased to the fledgling Cahir Presbyterian congregation, who purchased the freehold in 1897. Cahir also has a Coptic Orthodox Congregation. The Craft Granary is a fine stone building on Church Street, constructed in two stages in the C19th by the Butler family. Over the years it has had many uses including a linen spinning factory and a grain store. Almost completely destroyed by fire in 1985, it was carefully restored in the late 1990s and reopened in 2000 as a regional craft centre, one of four in Ireland. Incorporating a large Gallery for exhibitions of paintings, sculpture and photography, the Craft Granary showcases and sells the work of craftspeople from the surrounding region, including pottery, textiles, wood-turning, furniture, soft furnishings, toys, hand-blown glassware and jewellery. William Tinsley (Clonmel 1804 – Indianapolis 1885), the local builder-architect to whom much of the credit for Cahir’s elegant streetscapes and Victorian buildings is due, also designed / built other important works in the region. An Anglican-born convert to Methodism, he found his livelihood largely ruined by the Great Famine, so he emigrated with his wife and nine children to the USA, settling in Cincinnati Ohio in 1851 , and is best remembered as the designer of several prestigious edifices in the Midwest. The Square and adjoining streets contain buildings of a high architectural standard with some unusual features, such as the use of hood-moulding over windows, cut-stone arches and surrounds and unusual iron-work. The Butler-Charteris Memorial Fountain in the Square was erected in 1876 by Lady Margaret Butler-Charteris (d. 1915) in memory of her husband and to provide the the town with fresh water via pipes laid at great cost across several miles from the Galty Mountains, using a gravity feed of progressively narrower diameter. In 1926-28 the service was extended to supply private houses in the town, and remained the property of the Estate until 1962. The modern Library on the Square has a spacious hall for exhibitions; in 2012 the items on display provided insights into the Great Famine. The Blind Piper Statue in front of the Library depicts Edward Keating Hyland (Cahir 1780 – Dublin 1845), a distant relative of the great historian Geoffrey Keating. Having lost his sight to smallpox at the age of 15, he became an expert player of the Uileann Pipes, best remembered for composing The Fox Chase. He played for King George IV during the royal visit to Dublin in 1821, and the monarch was so impressed that presented the musician with a set of Uileann Pipes worth 50 Guineas, a very large sum for that time. The bronze sculpture by Mona Croome-Carroll was unveiled in November 2000. The War Memorial on Castle Street, erected to the memory of 88 local officers and men who fell in the Great War (1914-18), was funded by local subscription and unveiled on 20th November 1930, a rare event in Southern Ireland at the time. In 1996, the monument was cleaned and rededicated to include all men and women of the town and district who have died in armed conflicts at home and abroad. The Sensory & Mobility Garden in Church Street, created primarily for people with disabilities, contains scented plants, sculptures, water features, Braille signs, pathways of different textures and much to stimulate the senses. Opened in 2005, it provides a peaceful place to unwind. Cahir House Hotel***, built in the late C18th as the seat of the 10th Lord Caher / 1st Earl of Glengall, is a central landmark in the town. Held in high regard as a hotel for over a century, but sadly lacking in lifts, it has very pleasant bedrooms and a reputedly excellent restaurant, while O’Brien’s Bar is probably the most popular drinking place in Cahir. Tinsley House, a C19th townhouse named after the local architect, is a former antique shop with bedrooms upstairs. Centrally located, the beautifully furnished family home of Liam and Patricia Roche provides very reasonably priced B&B Accomodation. Carrigeen Castle (1816) replaced a previous fort used by King William III‘s Danish troops in 1690. The present castellated building, designed by Michael Bernard Mullins to overawe the local population, was built as a Bridewell (small gaol with holding cells), lavishly funded by the County Tipperary Grand Jury (predecessor of the County Council), at the behest of the elder Richard Butler. Each cell contained, per person, one iron bedstead, one bed ticken and three blankets. The prisoners were fed a pound of bread and a pint of new milk for breakfast, and a pound of bread and a pint of skimmed milk for dinner. Closed by the prison authorities in 1878, the keepers’ residence was leased to local military officers until 1919, when it was acquired by David Butler (1890-1955), whose son Séan Butler renovated the entire building and opened it a a Guesthouse in 1976. His wife Peig and son David still provide well reviewed B&B accommodation, attracting particularly favourable comments for the fine breakfasts and views over the town, but mixed opinions about the hostess’ forthright opinions. The Suir Mills, built c. 1800 on the eastern riverbank, occupy a site featuring a distinctive octagonal edifice with a pyramidal roof, added c.1860 and still in use as a bakery. The complex was among several mentioned by CS Hall (1846), who explained that Cahir’s “remarkably cheerful aspect and its prosperity is … derived principally from the extensive flour mills …conducted almost exclusively by people called Quakers“. Lewis (1837) also referred to “five very extensive flour mills” (one owned by the Walpole family) and wrote that “the mill at Cahir Abbey, the property of Mr. Grubb, is on a very large scale and is worked by an engine of 80-horse power“, but placed more emphasis on the replacement of the local linen industry in 1822 by a “Leghorn, Tuscan, British, and fancy straw plat manufactory …. in which a large number of females is employed” which “the pecuniary assistance afforded by the Earl of Glengall has enabled the present proprietor, Mr. Richard Butler, to carry it on as extensively as before….Weaving-looms for fancy plats of Italian straw with silk, of very ingenious workmanship, have been recently established, and ….. arrangements are in progress for considerably extending this branch of the trade“. Cahir Barracks, located at Kilcommon just south of Cahir, was constructed in 1811 as the main British Army cavalry barracks in Tipperary, and was the HQ for the South Irish Horse. Numbering some 1000 men, the military presence brought economic and social benefits to the town, and meant that from very early on there was a football club, a polo ground, a cricket club and regattas. A good relationship existed between the army and the local people until the War of Independence. Although the complex was destroyed during the Civil War, parts of the wall, gates and soldiers’ social club building are still visible. Crimean Bob (1828-1862), a particularly distinguished warrior, was commemorated in Cahir Barracks by a plaque, a replica of which can be found on the wall below the modern Library in the Square. Cahir Railway Station, a handsome cut-stone edifice cleverly designed by WG Murray, opened in 1852, and nowadays has a weekday passenger service of three trains to Limerick Junction and three to Waterford. The station is unstaffed and the platform is accessible via a ramp. Cahir sits on what used to be a major crossroads between Clonmel, Cashel on ByRoute 5 and Tipperary Town on ByRoute 6, and is not far from Clogheen on ByRoute 3. 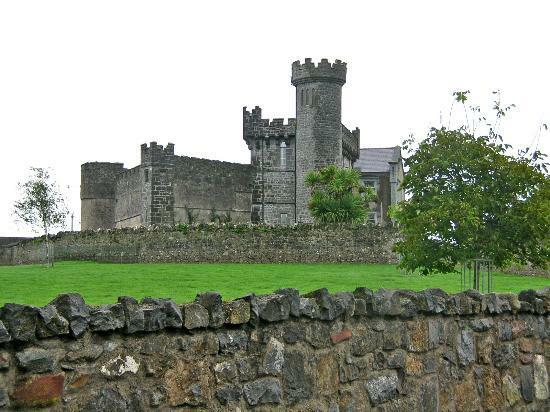 Roosca / Ruscoe Castle was the home of James Butler, hanged in Clonmel in 1653 for leading attacks on Golden during the Wars of the Three Kingdoms.